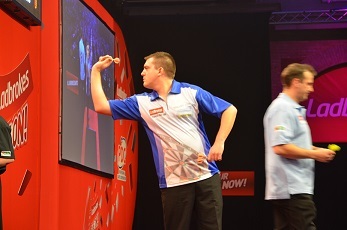 Ben Ward changed to the PDC in 2012 after he had played for one year on the BDO circuit. He competed in the PDC Challenge and won two of the tournaments. At the end of the season he was due to his successes ranked second in the Challenge Tour Order of Merit and was rewarded with a place in the preliminary round of the PDC World Championship 2014 and a Tour Card. Ward lost his preliminary round match to Austrian Zoran Lerchbacher. He qualified for the UK Open 2014 but lost second round to Steve Maish.